Soviet Red Army Guards Division marches in front of the Brandenburger Tor ("Gate") Brandenburg Gate, near Pariser Platz, Berlin, in May 1945. The Brandenburg Gate was finished in 1791. Napoleon crossed the Gate in 1806 in a triumphal parade after he defeated the Prussians. The Brandenburg Quadriga, a sculpture of a Roman chariot drawn by four horses, was taken to Paris on his orders. When Napoleon was defeated it was returned in 1816. After the Franco-Prussian War in 1871, and again in 1914, captured artillery pieces were paraded through the Brandenburg Gate. The Nazis, under he direction of Albert Speer, widened the avenue and added columns with Swastikas and Eagles. As the Soviets approached Berlin in 1945, the Brandenburg Gate was both a political and tactical objective. This view shows the perspective from Charlottenburger Strasse (today the Strasse des 17. Juni) towards the east and Unter Den Linden. Note artillery shell hole in the top of the Gate. Wrecked vehicles and corpses have been hurriedly cleared; note scaffolding added to climb to the top. The flag shown was reputed in 1945 to be the first flag raised over Berlin, but Soviet propaganda obscured the actual flag raising. 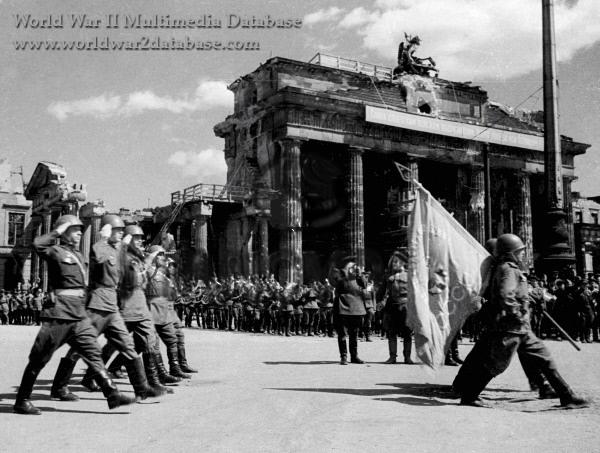 The 39th Guards Rifle Division, with the 207th and 150th Rifle Divisions, linked up at the Brandenburg Gate before assaulting the Reichstag a block away. Guards flags had Za nasu sovetskuju rodinu ("For Our Soviet Motherland") with a picture of first Soviet Premier Vladimir Lenin (April 22, 1870 - January 21, 1924) and CCCP (translated as "SSSR", Soyuz Sovetskikh Sotsialisticheskikh Respublik, "Union of Soviet Socialist Republics") on one side. The obverse of each flag had Smert’ Nemeckim Okkupantam ("Death to German Invaders!") with the Guard unit's number. The Soviets removed the Brandenburg Quadriga in late 1945 and flew a Red Banner from a large flagpole until 1957. The Brandenburg Gate crossing between East and West berlin was closed from 1961 until reunification in 1989. Today the area is closed to vehicle traffic. Brandenburg Gate was extensively restored in 2002. The restoration finally fixed severe war damage from 1945. "Soviet Signalman Petting A Kitten On The Breastwork Trenches"